Hello my friends, my name is Ilya Zlobin and I have been working with world and ancient coins for over 15 years now. I run an eBay store http://www.ebaystores.com/Authentic-Ancient-Greek-Roman-Coins/ with over 18,000 items. I am technically a collector until someone buys the item I am selling, so I am writing this article to take a beginner or even advanced collector to an even higher level. This arrticle and video explains how one would keep track of such a record number of items, stay organized and be able to display these comfortably and professionally while having fun. I believe that presentation is important and keeping organized gets other people interesting in collecting also. This is especially important information for those deciding to start a collection that will be an heirloom for countless generations. I hope that you can appreciate this article, as this is the entire time period condensed into an easy-to-follow guide. My intention is to benefit you and help you help yourself build an even more amazing coin collection that you can enjoy even more with a few simple techniques and tools. Shop with a reputable ancient Greek and Roman and world coin dealer. It is best if he/she has a great track record and provide a guarantee of authenticity. Also a beautiful certificate is also an added bonus (can be considered a $25-$50 value) absolutely free when you shop with Ilya Zlobin. A reputable seller would be happy to give a refund or exchange should professional coin grading companies or people such as David R. Sear or NGC find a coin is other than described. I am sharing everything I know about the supplies, years of experience condensed to a simple guide. Hopefully you can appreciate the tips, many of which even the most advanced collectors and even coin dealers can benefit from. 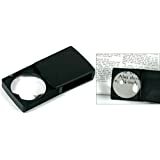 This coin magnifier most people enjoy because it gives you just the right amount magnification to see the coin and easily closes up and folds into your pocket. It’s called the Bausch & Lomb 5X Packette Magnifier Magnifying Glass. I use both types of coin flips below, with the second one being preferable for silver. Perhaps if you get either one, get the second one. But I am giving you both to chose from. These double pocket coin flips are available in 1 1/2, 2 x 2 and 2 1/2 inch sizes, some include paper inserts. Non-Plasticized flips are slightly more rigid than regular vinyl flips. They are considered safe for long term storage of your coins. Acids and chemicals have been reduced to a minimum.Good for long term storage. The chemical will not migrate. 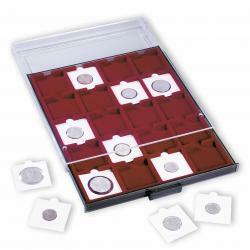 Our display trays are available for storing cardboard coin holders in 1½” x 1½” and 2″ x 2″ sizes and for slab coin holders in either a horizontal or vertical arrangement; or a full flat tray to use any way you like! A plastic coin storage box for 2×2 cardboard or plastic coin holders. The reason being, is that if it’s a plastic one, it has notches, but some ancient coins are thicker than others, so when you have coins of varying thickness, you may want to just put them in these cardboard boxes as it is more flexible for your collection. Don’t let the word cardboard fool you, as these are super high quality and feel good in hand. ALSO these are good for oversized medals or 2.5 x 2.5 coin flips. Additional Tip: If you like to put the slab in a bag before putting it in the box, you may want to get the https://www.amazon.com/gp/product/B003ZZS63A/ Plymor 3″ x 4″, 4 Mil (Case of 1000) Heavy Duty Plastic Reclosable Zipper Bags . This is the exact size for those slabs. 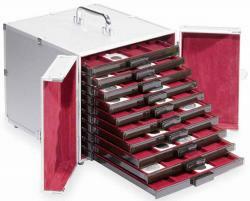 The benefit of the carrying case and trays is that you can lay your coins out for display at a coin show or for your own private viewing pleasure. You can have them in the individual notches with or without the plastic coin flip so that you can have them easily organized and viewable. The older generations of coin collectors would have wood versions of these and would describe them as coin cabinets. I think these are really great and made in Europe, possibly Germany, the clear plastic shroud is removable and can be placed on the table at a coin show very easily, and removed to view coins easily too. The trays stack very well atop each other. The benefit of these is that you can get these without the case and they easily stack up. Advanced tip, I have the trays organized in numerical order as I have 20 and put a removable sticker https://www.amazon.com/gp/product/B00007M5L2/, the Avery Removable Rectangular Labels, 0.31 x 0.5 Inches, White, Pack of 1100 (5412), with the tray number so that after the coin show I can easily put these away. Additional tip is that you can use these removable stickers to attach additional information about the price for example about a coin which you may want to remove later, useful for slabbed coins. Comes in Red and Black background. Put these in a binder of your choice and you can be golden. Keeping good records adds to the pleasure of your collection. Article by Ilya Zlobin, world-renowned expert numismatist, enthusiast, author and dealer in authentic ancient Greek, ancient Roman, ancient Byzantine coins and beyond, running the eBay store Authentic Ancient Greek Roman Coins. Reallife History Create a free website or blog at WordPress.com.